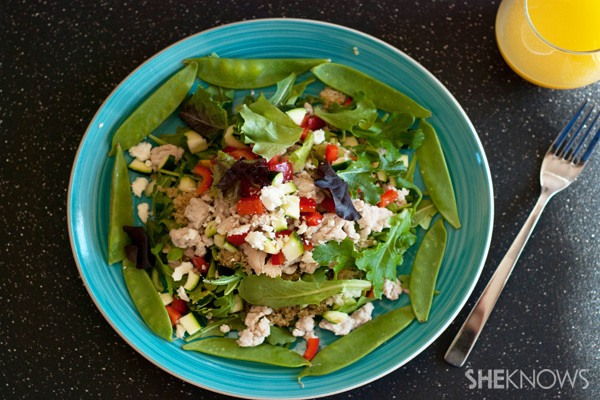 Organic lean ground turkey breast is the star in these two delicious and healthy recipes. 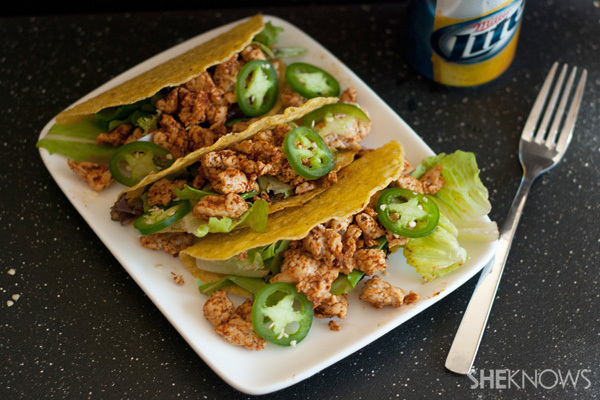 Try the warm turkey and quinoa salad or opt for the spicy chipotle turkey tacos. You can’t go wrong with either dish. Most times when we think of turkey it’s during the holidays, but organic ground turkey breast is a great way to add healthy protein to your diet any time of the year. This is a great replacement for ground beef if you are not a red meat eater or if you are just interested in switching things up in recipes. Here I share two ways we enjoy using ground turkey in our home. Both recipes can be made ahead of time, making them great choices for weeknight meals. Spray a large pan with nonstick cooking spray. Over medium-high heat, add the turkey and cook until no longer pink. Add the taco seasoning, Mrs. Dash and water, stirring until the liquid has evaporated. Divide the lettuce and the cooked turkey between each of the taco shells. Garnish with fresh jalapeño slices and serve warm. Tip: You can also top these tacos with other toppings such as cheese, salsa, sour cream or avocado if desired. Divide the salad greens between two large plates. Add 1/2 cup cooked quinoa to each salad and set aside. Spray a pan with nonstick cooking spray. Over medium heat, add the turkey and cook until no longer pink. Once the turkey is cooked, add in Italian salad dressing, continuing to cook until warmed. Spoon the turkey over the tops of both salads and top with diced cucumbers and red peppers. Decorate the bottom of the plate with the snow peas or sugar snap peas and finish the salad with 2 tablespoons of crumbled feta per salad. Serve immediately. Whip up one of these recipes with ground turkey.